Four to five inches long. Black crown, brown wings and tail. White brow and thin white strip from above the base of the beak, above the eye, to the back of the head. White throat and cheeks. Gray back. Light rusty red or gold underside. Lives in coniferous and mixed forests throughout the West Coast and Rocky Mountain States, most of Canada and southern Alaska, the Great Lakes region, and from Nova Scotia and New Brunswick to Appalachia. 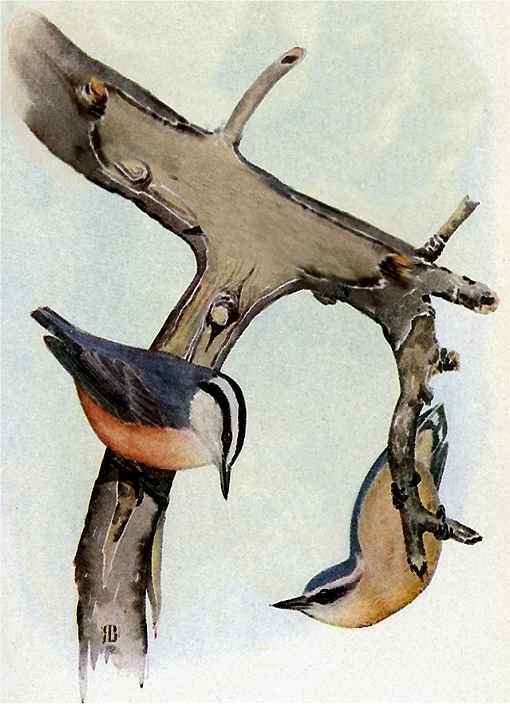 Varying numbers of red-breasted nuthatches may migrate moderate distances depending on each season’s pine cone crop, possibly as far as southern US or northern Mexico. Builds grass nests in natural or abandon woodpecker cavities or birdhouses from a few feet to well out of reach. Lays four to six, more or less, creamy white speckled eggs which hatch after about two weeks incubation and young leave the nest in about another three weeks. Smears sticky tree pitch (sap) around the outside of their cavity entrances. Runs about, down, up, and underneath coniferous (pine and spruce) tree limbs foraging for insects and spiders inhabiting bark crevices. Eats pine seeds and is attracted to suet feeders. A territorial bird, it may be seen chasing other bird species away from nesting and foraging spaces. The Red-breasted Nuthatch Birdhouse (same as for the White-breasted Nuthatches, Chickadees, Titmice and Downy Woodpeckers) has a 4″ by 4″ floor, 9″ inside ceiling, 1 1/4″ diameter entrance hole located 7″ above the floor, ventilation openings, hinged roof secured with shutter hooks and is assembled with screws. More about this birdhouse. Mount nest box on a tree trunk between eye level and up to 15 feet if necessary. At least out of reach is best to deter the curious, unless the box is well concealed. Because nuthatches commonly nest in natural or abandon cavities, or excavate their own cavities, place a few chips on the nest box floor. Make more attractive to nuthatches by fixing bark with nails or glue to the nest box exterior. Varying numbers may migrate moderate distances depending on each season’s pine cone crop, as far as southern US or northern Mexico. Secures nuts in the cracks of bark so it may hammer them apart or for later retrieval. 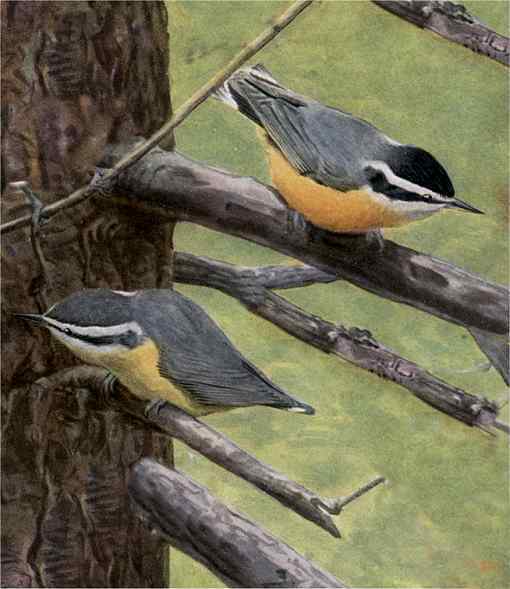 Nuthatches feed with chickadees and titmice at feeders. The Red-breasted Nuthatch Birdhouse (same as for the White-breasted Nuthatches, Chickadees, Titmice and Downy Woodpeckers) has a 4″ by 4″ floor, 9″ inside ceiling, 1 1/4″ diameter entrance hole located 7″ above the floor, ventilation openings, hinged roof secured with shutter hooks and is assembled with screws. Mount nest box on a tree trunk between eye level and up to 15 feet if necessary. It is best mounted at least as high as just out of reach unless it is well concealed. Place a few chips on the nest box floor. Make the box more attractive to nuthatches by fixing bark with nails or glue to the nest box exterior.